First, the book was never published by Unity and the author is virtually unknown. But her book is the only one I've found, other than Lessons In Truth, that received a powerful, written endorsement by Charles Fillmore. 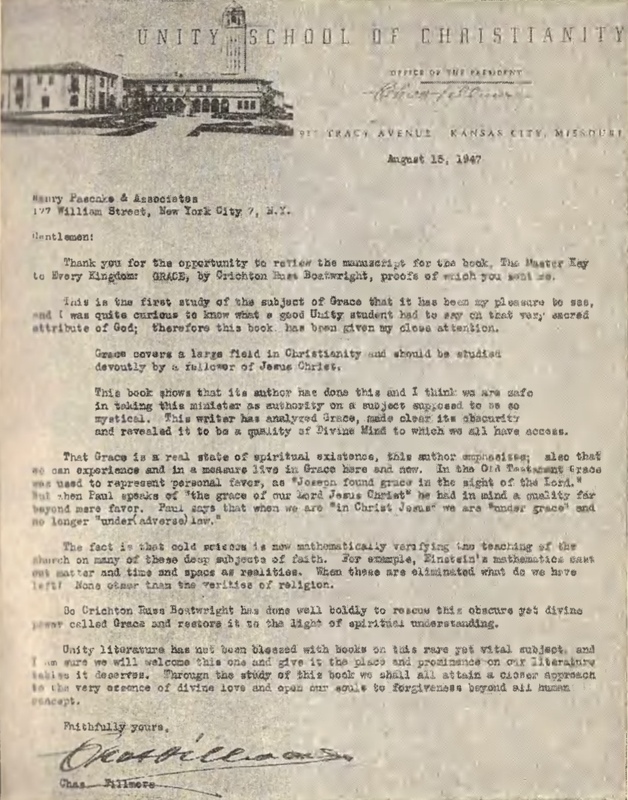 Second, the material is filled with original ideas or ideas that she brings into new understanding, such as this one on page 52 where human desire is distinguished from divine desire: "Human desire has been defined as an “urge to experience in the outer a perfection not felt within,” while “divine desire is an urge to express in the outer a perfection (ability) that is first realized within.” That's metaphysical language at its best—subtle and powerful. Theologians have bashed desire for centuries, but none of them have described it so powerfully, nor defended it so eloquently. Third, she has provided a metaphysical theology of not only grace, but also a theology of the entire sequence of crucifixion, resurrection, ascension and Pentecost; she has provided a christology for understanding Christ Jesus as not just Way Shower but also Way Maker; she has provided an eschatology for understanding why the departure of Jesus opens us to the Holy Comforter and how it leads us to inhabit “many mansions”; and she has provided a whole new explanation of the vicarious atonement that honors the historical account of Jesus’ crucifixion without wallowing in bloody pity and shame. Fourth, which you can guess from what I've written, this book is a heart-centered, metaphysical Christian theology that speaks to the heart as well as to the intellect. Finally, there are a few other resources that are similar scattered throughout TruthUnity. Taken together, these resources provide a coherent, powerful theology of metaphysical Christianity. Because of their congruence and harmony, and because they speak in the religious language of the majority of people in the world today, I have assembled them in a new tab on TruthUnity: https://www.truthunity.net/christianity. I hope this book by Crichton Russ Boatwright is a blessing to you. The book I am about to introduce to you was never published by Unity. It may be in the Unity Library, but I’ve never come across it. It was never mentioned in my training to become a Licensed teacher. 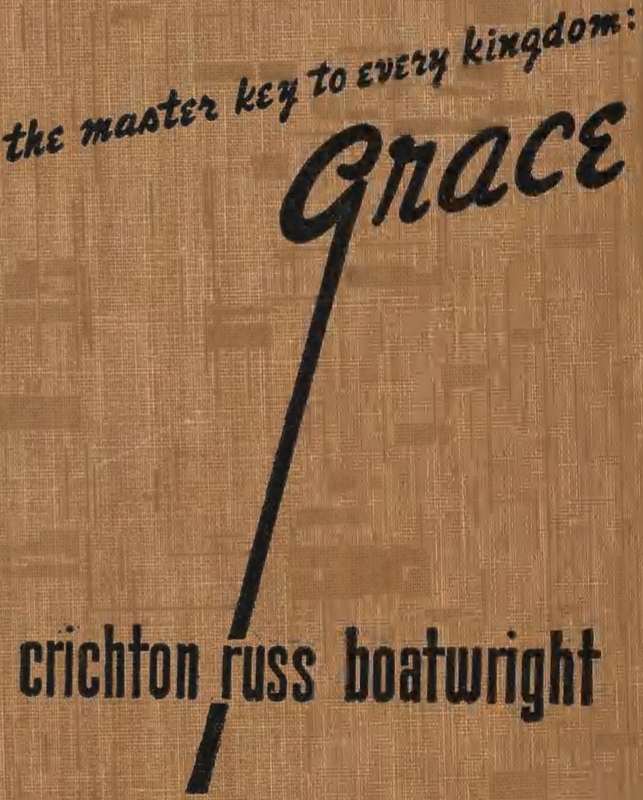 The author, Crichton Russ Boatwright, like her book, is almost totally unrecognized in Unity. 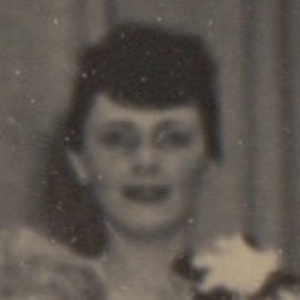 The Unity Archives has a self-reported 1947 survey about her, and she appears in the 1942 ordination photos, but that’s all. 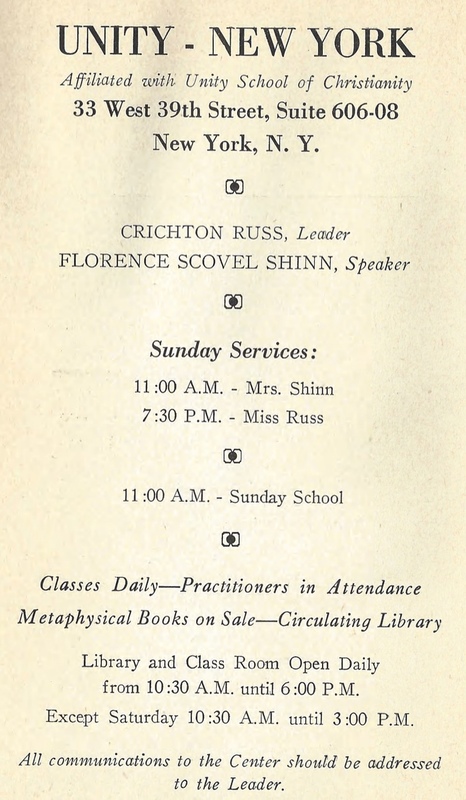 I never would have searched to find out more about Crichton Russ if it hadn’t been for the advertisement you see here in the 1938 edition of Florence Scovel Shinn's book The Game of Life and How To Play It. See her name in there? See “Crichton Russ, Leader”? Without her, Florence Scovel Shinn may never have had a platform to teach her prosperity lessons. She opened the door for Shinn. 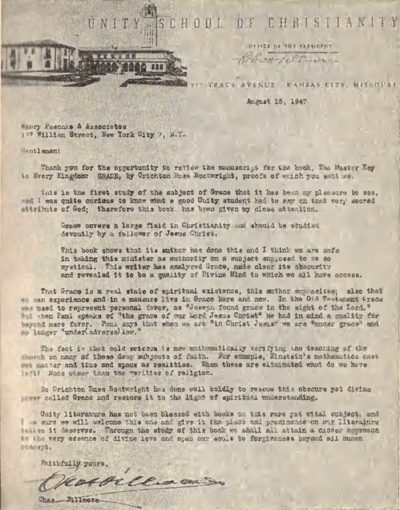 So who was Crichton Russ Boatwright? Well, come to find out that she was ordained a minister in 1942 and she was the leader of Unity in NYC after Georgiana Tree West. She had learned from Richard Lynch. 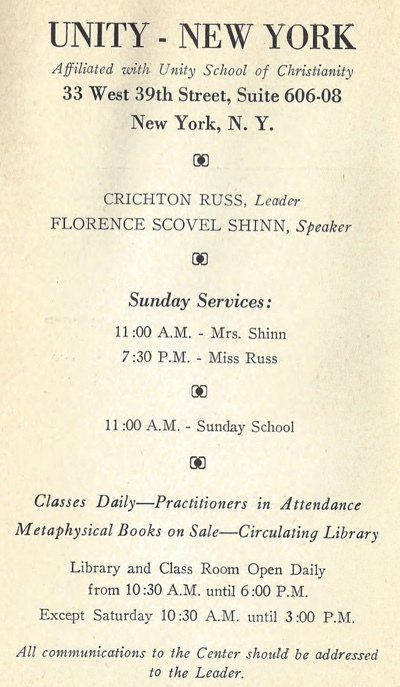 And as noted, she shared the stage with Florence Scovel Shinn. Lynch, West and Shinn—Whew! One is an urge to experience, the other is an urge to express. One is void of feeling, the other is realized within. That's metaphysical language at its best—subtle and powerful. Theologians have bashed desire for centuries, but none of them have described it so powerfully, nor defended it so eloquently. But her book has far more than original insights. 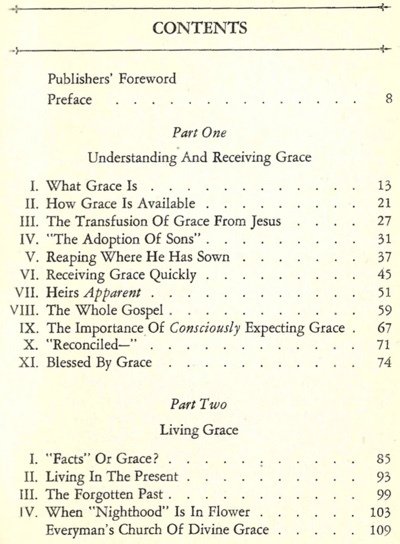 She has provided a metaphysical theology of not only grace, but also a theology of the entire sequence of crucifixion, resurrection, ascension and Pentecost; she has provided a christology for understanding Christ Jesus as not just Way Shower but also Way Maker; she has provided an eschatology for understanding why the departure of Jesus opens us to the Holy Comforter and how it leads us to inhabit “many mansions”; and she has provided a whole new explanation of the vicarious atonement that honors the historical account of Jesus’ crucifixion without wallowing in bloody pity and shame. Which should give you a clue about the tone of this book — it’s heart-centered, metaphysical Christian theology that speaks to the heart as well as to the intellect. There are a few other resources that are similar, such as May Rowland’s Jesus Christ, An Ever-present Reality, Debbie Tyson’s USRS classes on the Holy Spirit, Carol Ruth Knox’s Prayer of the Heart and Charles Fillmore’s Keep a True Lent and Jesus Christ Heals. Taken together, these resources provide a coherent, powerful theology of metaphysical Christianity. It’s theology—not metaphysics—by which I mean they speak of God and they do so in the language of Christianity. Because of their congruence and harmony, and because they speak in the religious language of the majority of people in the world today, I have assembled them in a new tab on TruthUnity: https://www.truthunity.net/christianity. Thank you, Randall Keller, for creating and sharing the PDF formatted for printing!